More fun than a barrel of gin? The last few weeks have flown by in a whirl of projects, bottling and tasting hours. It has been great to see so many faces in the tasting room and get direct feedback on some of the newest concoctions. One of the things that has been the most fun for us is introducing new flavors to people that come in to taste. Everyone has their favorite go-to drink before they arrive here and we enjoy seeing if that still holds up when they leave. The biggest swing seems to be around gin - people come in loving gin or making a 'Errr...do I have to?' face when we go through the tasting options. I admit to being one of those less-than-thrilled folks until having our latest rounds of drinks - my admittedly very limited experience with gin & tonics left me wondering why people were so enthusiastic about it. So when Nick and Dave started talking about distilling gin, I was vigorously voting for putting it last on the list. Glad they didn't listen to me, however, as we now have several great options that make it easy for me (and many of you reluctant types) to understand the appeal. As of today, we have two ready-to-purchase options - a traditional London-dry style great for G&Ts and an extremely smooth barrel-aged gin that is fantastic for sipping over ice. The barrel we emptied this weekend is particularly good as we aged it twice as long as our previous efforts, and the results are worth the wait (ask for a bottle from Batch 2 if you want to try it). 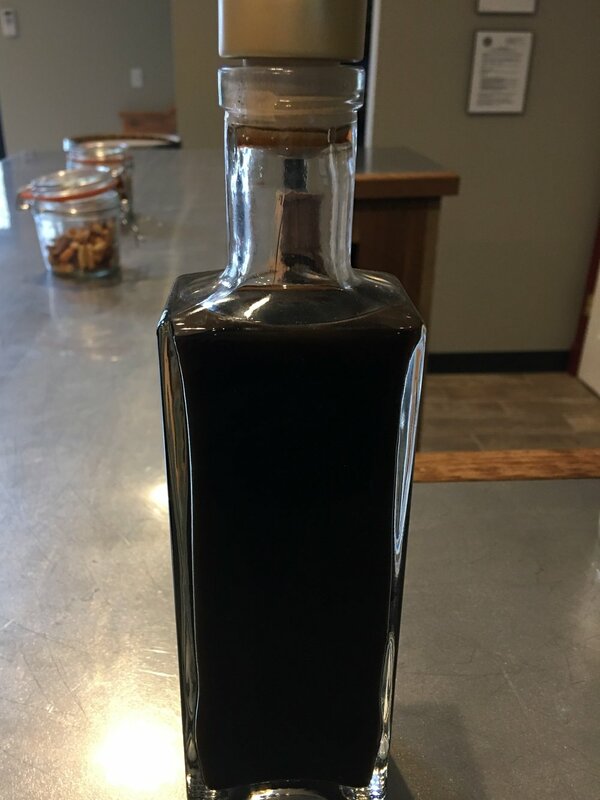 We have experimental batches of elderberry gin and an odd-sounding-but-great Aronia (Chokeberry) gin that we're hoping to have purchase-ready in a month or two from the tasting room. Finally, for those of you that are waiting very patiently, we have a (insert your favorite old-timey TV news bulletin noise)...Coffee Spirit Update! You have not been shy about your love of the coffee/vodka spirit we have in the tasting room and we are working hard to get that ready for shelves. Recipe is great, bottles are ordered and label design is almost done. Had a visit with our coffee distributor yesterday to taste test and talk beans and we are hoping to start large batch production in the next couple of weeks. Oddly enough, we've found that it is pretty rare for coffee-flavored spirits to use actual coffee - most use a coffee flavoring or additive. The process of actually making large, fresh batches of coffee with great beans as a starting point is definitely more labor and cost intensive than adding a few drops of flavor in just before bottling, but we think the smell and the taste from the real thing are worth it. We are doing our best to have it ready by the holidays - watch the website and social media pages for updates. This will be another big week for us. We will be bottling the lovely new aged gin and putting our newly redesigned labels on it, anticipating a story in the Sun Prairie Star about Two Tall and finalizing plans for our December workshop with Odin from iStill. We have distilling enthusiasts coming in from New York, Winnipeg, Missouri, and several other far-flung locations to spend December 14 and 15 with us learning to distill and extract with the iStill equipment. Details can be found on our Classes page if you want to join them. Thank you for your continued support of this crazy little adventure!